We provide our clients a wide range of Bud Cap Net, which is primarily applied at the time of budding. The bud caps can be retained till proper blooming of flowers. We are importers and supplier of Rose Bud Caps. -12cm in Pink, White and Yellow colour. Please contact us directly for Best Price and other details. 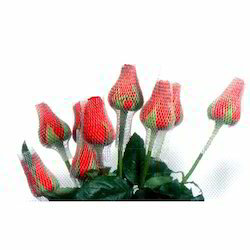 Vega Marketing Co. supply rosebud net that plays a vital role in improving the quality of rosebuds, right from the budding stage till the flower is ready for despatch. Soft sleeve is widely used in floriculture industry and especially in Dutch roses that requires controlled development during budding. A high quality rosebud will be large in size (long bud with a well formed, heavy base). 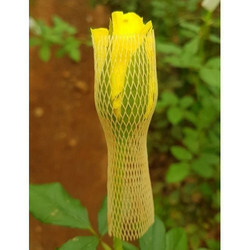 We manufacture Tuflex rosebud net that plays a vital role in improving the quality of rosebuds, right from the budding stage till the flower is ready for despatch. Our soft sleeve is widely used in floriculture industry and especially in Dutch roses that requires controlled development during budding. A high quality rosebud will be large in size (long bud with a well formed, heavy base).